Second edition, 1981. Bantam Books. Over 500,000 copies of Focusing have been sold worldwide. It has been translated into seventeen languages including: French, German, Spanish, Dutch, Danish, Japanese, Swedish, Hungarian, Italian, Hebrew, Chinese and Greek. Focusing is available in most major bookstores, and can be ordered either from your local bookstore or directly from us. 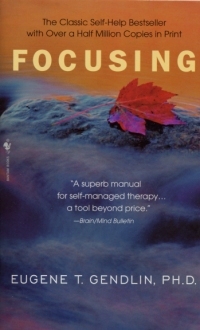 Focusing, the technique described in the pages of this book, is uniquely suited to our turbulent times when so many old forms are crumbling and old roles are vanishing. Most of us are having to invent, discover and create the next steps of our lives without a light, a map, or a relevant tradition. We are trying to keep apace of rapidly changing technology, trying to understand ourselves and our relationships, seeking new ways to be well, looking for meaning in our work and a new center of gravity within ourselves. ... Focusing is a key to personal momentum and unfolding, a dynamic process that can guide us through the tricky mazeways of a new world. Like any powerful, new idea, focusing is not readily described in old terms. It moves us into unfamiliar territory, the realm of creative potential that we have usually considered the province of artists and inventors. Our brains and bodies know far more than is normally available to us. We are conscious of only a fragment of what we deeply know.... The complex body-mind can provide new steps. Our deepest bodily knowledge can be welcomed and then lived further. Focusing, whose steps are described with care and clarity, taps and articulates new subliminal knowing. It befriends and listens to "the body", a term [that is used] comprehensively to mean the total brain-mind environment as we sense it. Focusing is at once richly complex and surprisingly simple. It is mental and kinesthetic, mysterious in its capacity to summon buried wisdom, holistic in its respect for the "felt sense" of a problem. An effective method in itself, it is also valuable in conjunction with a variety of psychotherapies, with biofeedback, with meditation, to unblock the creative process and define problems. Focusing grew out of the observation by Gendlin and his co-workers that many people were not being helped by traditional therapy. Those greatly improved were distinctive in their ability to tap an internal process ignored by most clients. [He] determined to understand this process so it could be taught and used by anyone. Focusing can foster major shifts. With these more profound changes ... a body shift sometimes occurs without the usual accompanying words, phrases or images. "A whole constellation is changing. The ideas are so new we don’t yet have a way to talk about them." Usually, he said, we react in accustomed ways, "repacking our experiences in the same old concepts, when what we need is to let something wider in." If the focuser stays with the bodily sense of the shifting constellation, eventually new language and new metaphors, appropriate to the fresh understanding, will emerge. Focusing is no conventional repackaging of self-help wisdom. It is at once a manual and a philosophy. It talks about the body’s wisdom, the steps of the focusing technique, how to discover the richness in others by learning to listen. It looks at the potential for a new kind of relationship and a new kind of society, transcending outmoded roles and patterns. "A new society is forming ... one in which the individuals are much more developed and aware than has been true throughout history ... A society of pattern-makers is coming." This book is about that society and about how we can ease its emergence by helping ourselves and each other.